I wonder how many of you notice the pictures and model illustrations that often accompany these articles. Notice the type . . . the distinct muscular shape of each lifter. For example, Henry Steinborn, with the hollow formed in the upper back by the trapezius. The high “trap” formation of Reg Park. The full bulk of Ed Theriault. Steinborn exhibits the heavy uniformity of development while Park shows a more modern combination of bulk and definition. Theriault exemplifies what a light-boned man can build with modern exercise. Steinborn’s trapezius development came from heavy cleaning, snatching with one hand, plus supporting immensely heavy weights across his shoulders. when squatting, Reg Park practices Hack lifts with weights up to 500 pounds, and High Pull-ups . . . a movement that is an “extension” of the upright rowing motion, in that does not stop when the bar is chin height but continues on until it is at arms’ length overhead. Ed Theriault uses very heavy stiff-legged dead lifts and bent-forward rowing motions. In all these exercises the muscle is influenced in different ways and the fact that each man has obtained a widely differing trapezius development . . . apart from what significance his physical type has on the musculature . . . points plainly to one thing . . . that for COMPLETE development of any given muscle group a COMPREHENSIVE schedule of exercises is needed. One or two exercises with a standard piece of equipment, are not nearly sufficient to gain the maximum in strength, size and musculature. You MUST use a wide range of movements with apparatus that provides a wide range of muscle action. It would do well for you to remember here that there are some muscle actions that cannot be obtained with the use of barbells, or dumbells, and particularly is this true where the squeezing and crushing muscles are concerned. And it should also be plain that a “constricted” system of exercise will give you a “restricted” development. You will never build a symmetrical or fully developed physique unless you do two things – Specialize, and use as many movements as possible within your energy limits. Nest to these principles comes the selection of the most effective movements, grading the exercises so that the one that affects you the most comes first in the program, with the others in order of their effectiveness. The type of exercise a man follows shows plainly in his development, as the above examples prove. Yet, if these men had stuck to a single movement to provide trapezius development, their shoulder musculature would not be nearly so marked nor half as powerful as it is. In an earlier article we studied the action of the traps, and we saw that the muscle is in reality divided into four parts, and NOT TRIANGULAR shaped as some authorities have previously taught. We also learned that it has a profound effect on posture, lifting weights to the shoulders and above the head, and weight gaining. You were also shown the movements that worked the muscle in its four ways. Now in this article we well consider the other exercises that can be part of a trapezius specialization schedule. It is customary with novelists, when they write about men from the “Frozen North” or any other place where pioneering is at a premium to talk about the build of the story’s hero. They usually wind up something like this: “He had those thick, sloping shoulders, the true hallmark of the naturally strong man.” It’s a shot in the dark but one that hits the mark, for, if you have been at any lifting show and watched the champions go through their paces, you will notice the long powerful fall of the traps from the neck to the deltoids. It has been said that too heavy a trapezius development detracts from a square-shouldered appearance, and this detracts from the breadth of chest and shoulders. With this I do not agree. Shoulders that are square because of lack of trap development make the neck look too long, thus adding height and actually minimizing the appearance of broadness. Study a picture of any bodybuilding star. What do you see? There is, in addition to the downward sweep of the trapezius, a marked superiority of deltoid musculature. And in addition to this the collar bones are very long and the chest high and arched. Broad shoulders are composed of many factors, the most important of which is framework; then comes the muscle development. But it is a fact that en who have well developed traps find it easy to build huge and powerful deltoids. The famous anatomist, Mackenzie, in one of his books pointed out that the deltoids are merely continuations of the trapezius muscle. How profoundly trapezius work affects the deltoids can be seen by conducting the following experiment. Hold an extremely heavy weight in the finish position of the deadlift for as long as possible without putting it down. Repeat this for a number of times. Next day observe what muscle groups are stiff. You will find that not only are the trapezius muscles sore, but also the lateral head of the deltoid from its crest right down to its insertion on the upper arm bone. As I have been constantly hammering at in all of my articles – it is NOT POSSIBLE for any bodybuilder to get the utmost from his physique potentials unless he can and DOES work HARD, work OFTEN and work SENSIBLY. At the risk of being accused of constant repetition I will again tell you that if you want to get an outstanding development of any given section of the physique you have GOT to drop work on a general routine and first consider your specialization needs. Now to get to the practical side of the article – the exercises for trapezius development and how to make use of them. First, the need for a course of specialization in trapezius development. Have you been using one or two standard exercises for a considerable period? Have you the feeling you’ve obtained all you can from your present course? If the answer is yes to these questions then the need for the exercise in this article is apparent. It is doubtful if you have used more that two or three of them, so I can promise without fear of my promise failing that you are going to make good progress with these movements which you may not have used up to now. Any profound change in an established order of things is bound to have an equally profound effect, and that is what you are seeking. First we have an exercise that to my knowledge has never before appeared in any publication and is little known out of certain bodybuilding circles. This exercise can be used to warm up with, and wind up, your trapezius routine. It increases circulation in the exercised area, thus helping to clear it of fatigue products. Lie on an incline bench, face down. Hold a towel in each hand. Have your training partner face the backboard of the incline bench and grasp an end of each towel. Your arms should be straight out and LOCKED at the elbows. From this position rotate and shrug the shoulders, squeezing the shoulder blades together as your training partner resists. He must learn to adjust his resistance so you are just able to move the shoulders. Perform as many reps as possible with the arms held straight out before you. Then, after a rest, lower the arms somewhat and again perform the movement from the new angle. After another short rest, repeat the process altering the angle of the arms as shown in the illustration. Don’t attempt to bend the arms. Keep them straight. All you should do is shrug the shoulders, rotate the shoulders and squeeze the shoulder blades together. Trainees who work out alone will find a way to implement this idea with a bit of thought and the use of heavily weighted pulley cables and proper incline bench placement. Here is another shrugging motion but with that little difference that produces better results. Sit on a flat exercise bench holding a heavy dumbell in each hand. Get your training partner to place his knee in the middle of your back and his hand against the back of your head. Shrug the shoulders as high as you can and at the same time press your head BACK. Your partner should resist the pressure of your head against his hand. Hook your legs around the legs of the bench for greater stability. Again, trainees who work out alone will find a way to improvise, for example, seated in front of a post with a ball behind the head, etc. Read the first installment of this article where the functions of the Trapezius muscle were explained . . . and you’ll see the need for that additional movement of pressing back the head. Use as heavy a poundage as possible with 4 sets of 5 reps, working up to 4 sets of 10 reps . . . then increase the exercising poundage by 10 pounds each dumbell. One of the main reasons Olympic lifters have such good trapezius development is the amount of snatching and heavy cleaning they practice. This development is made even more complete than if a single movement was used, because of the varying width of hand spacing in the two quick lifts. Now for an exercise that utilizes the favorable aspects of Olympic quick lifting. Stiff-legged cleans with a varying hand spacing can give you a good development of the second and third sections of the traps. Haul the weight up without the slightest bend of the knees and pull it as high as you can before settling it down across the collarbones. Lower and repeat. Start off with a poundage that you can handle for 3 sets of 8 reps, working up to 3 sets of 15 reps before increasing the weight. You will be obliged to handle a weight that seems light for the first few reps. This is in order that the main action is on the traps instead of the small of the back. One of the finest pieces of equipment for developing the upper back is a set of cables, and when it comes to trapezius musculature, few men have the contour, definition and power of Floyd Page, who has used a lot of cable work in his training programs. As you can see from the illustration, the arms are pulled back from straight out in front of the chest to the crucifix position. You will also get a lot of posterior deltoid work, too. Start off with a single strand and pull the arms back for 3 sets of 20 reps. Add a strand as soon as you can perform these 3 sets comfortably. Start off again with 3 sets of 15 reps and work up to 3 sets of 25 reps before adding another strand. This type of work will give you considerable definition because it employs a peak contraction principle, in addition to the normal type of muscle contraction. As the muscles work over a shorter range in pulling back, so the resistance of cables increases, providing the right amount of work exactly when it is needed. Don’t bend the arms at the elbows. Keep them straight throughout the movement. For building power in addition to size, the well-known cheating exercises are unexcelled, despite the “knocks” they get from various quarters. Here is one of them – Bouncing Power Shrugs. Start the movement as shown in the illustration. The weight should be resting on two boxes so you do not have to lift it too far. Take it up to the finish position of the two hands dead lift, then drop the weight down to the boxes and pull it up on the rebound, with a strong shrug of the shoulders. Pull the tips of the shoulders up as high as you can, making an effort to touch your ears. Of course you won’t do this, but make the effort. At the height of the shrug, squeeze the shoulder blades together. Use 3 sets of 8 reps. Work up to 3 sets of 12 weights before adding weight to the bar. 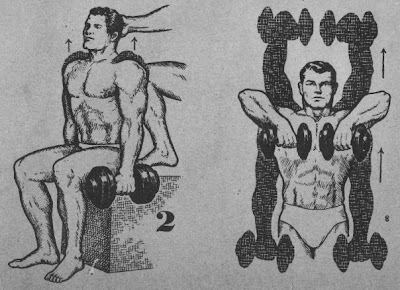 Dumbell rowing motions are immensely popular in weight training routines, and for one reason: They are the closest approach to a movement that works the trapezius muscles it their entirety. Bend forward until the trunk is level with the ground. One hand rests on a bench or a box while the other grips the dumbell. 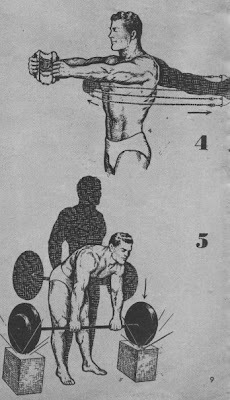 The dumbell is pulled up as high as possible until it is level with the shoulder. At this point the ELBOW is pointed up as high as the upper arm can be pulled back. You must take care not to twist the trunk to get the dumbell up. Keep the body as still as possible. Start off with 3 sets of 7 reps each hand, working up to 3 sets of 12 reps before increasing the exercise poundage. In most of the above movements you have had to work other muscles in addition to the trapezius. In other words, it has been essential to employ other groups in order to get the desired effect in the group undergoing specialization. Here is an exercise that makes use of isolation – Prone Laterals. Lie face down on a flat exercise bench. Grasp a dumbell in each hand. The arms hang at full stretch from shoulder to the floor. From this position raise the arms upwards and sideways until you reach a crucifix position. When here, raise them still further so that there is a squeezing together of the shoulder blades. The posterior deltoid also comes in for a good deal of work. Start off with 3 sets of 8 reps and work up to 3 sets of 15 reps before increasing the poundage. The final movement in this specialization schedule is one that has been used extensively by my good friend, Val Pasqua – the High Pull-up. Val uses a barbell but I advocate the use of dumbells because it is possible to obtain a better effect by pulling back the elbows when the weights are chest high, something you can’t do if the bar is used. Stand upright with a dumbell grasped in each hand. Pull the weights up in an upright rowing motion, but don’t stop at the chin. Continue on until they are at arms length overhead. As the dumbells get to chin level, squeeze the shoulder blades together as much as you are able. Start off with 3 sets of 8 reps, working up to 3 sets of 12 reps before increasing the dumbell weight. It should not be necessary for me to tell you that in undergoing this routine, you must devote all your efforts to it. Unfortunately, it is necessary for me to point out that when specializing on any section of the physique, all our efforts should be concentrated on the section FIRST during workouts, with the rest of the general exercises coming after. Too many lifters have the idea that you can stick these routines any place in a workout of any length and the results will be the same as if you were fresh and full of energy. So, take care of your trapezius specialization movements first, and let a minimal number of exercises for the remaining sections of your body come after.